Come fellowship with us before service for breakfast at 9:15 am in the cafe. 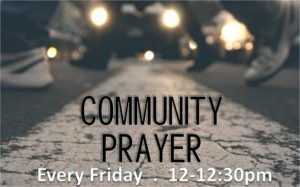 12:00 pm Community Prayer @ Check our Facebook page for location information each week! Community Prayer @ Check our Facebook page for location information each week!